So what is #DoItForDon? Why is this hashtag being used? In order to answer these questions, I have to begin at the end. It began with happiness. I had a notification from Facebook Messenger towards the end of my lunch hour on Friday, February 23, 2018, notifying me that I had a message with a photo attached from my aunt in Pennsylvania. I was excited because I had recently sent out change of address cards to my family and I thought that she was telling me that she had received her copy. Smiling, I looked down at the small window with her message that had popped up at the bottom of my screen. My smile slid into a look of confusion as I saw that the picture was a screenshot of a Facebook post instead. I glanced up at the accompanying message she wrote, saying she saw a post on Facebook that said my brother had died. She was wanting to know if I knew anything about it and if it were true. I could almost feel my brain do a double take as I stared at these words. What was my aunt talking about? Surely if something had happened to my brother, someone would have at least called my dad. Mind racing, I typed in my brother’s name into the Facebook search bar and opened his profile. Surely someone just hacked this other guys’ Facebook page and was playing a cruel joke on my brother’s friends and family. Message after message appeared as I scrolled down, “Rest in Peace,” “I can’t believe this is happening,” ” I am going to miss you.” Don’t they know that it can’t be true? His mother, brothers, grandmother, I can find no family names on this wall of sorrow either proving or disproving these statements. I turned back to my Facebook Messenger and took a deep breath as I readied myself to answer the other message that had popped up at the same time as my aunt’s. All this message said was, “Hey,” innocent, but by this moment, terrifying. This message was from my brother’s friend. I responded to her salutation, apprehensive of what she may type next. I do not envy her having to be the person that confirmed my fear. My brother, Donald “Donny” Donovan, died that morning at the age of 32 from injuries sustained in a single car accident. Nothing can prepare you for this kind of sudden loss. I remember sitting there, stunned, unsure of my next move. My breathing came out in small but quick puffs of air. I could feel my body thrumming with my suddenly rapid pulse (130 bpm while sitting), my hands shaking, my brain clouded in panic. I knew I needed to call my parents, I needed to leave my office, I wanted to go home. I didn’t want make the call in my office because I was terrified that the stopper I had placed on my more painful emotions would explode and I didn’t want my teammate in the other room worrying about me. At this time I felt lost, confused, barely thinking. I needed to go outside to call my parents, but by this time, my lunch had officially ended and my teammate was just starting her own lunch. I was in charge of answering my agency’s main phone line now. In my panicked state, I racked my brain, looking for a solution that would hinder as few people as possible and then walked with a quick step down the hall to ask another team member to answer phones while I ran downstairs, all the while concealing the reason why. Finally, I was able to call my mom, but when she answered, I could barely decide how to begin and hearing her voice loosened the strangle hold that I had on my emotions, tears finally threatening to fall. I did tell her and she told my dad. I had been too scared to call him myself. He had just left on a trip after he had lunch with me. I was so unsure of how he would react to this news and he was driving down the interstate. I couldn’t even begin to think how to tell him to pull over so that I could tell him the news that no one wants to hear. The phone call to my mom complete, I finally made my way up to the floor that my supervisor was on, beckoned her from the conference room, and told her of my horrible news as my tears finally broke through the dam and ran in warm rivulets down my cheeks. Confusion, panic, indecision, shock, grief, numbness, pain are all natural feelings when one learns of the passing of loved one, whether it be sudden or gradual. The hurt is all the same, just processed differently. However, no one should have to find out like I did, how over 90% of my brother’s immediate family did…on Facebook. I understood that my parents and I could be harder to for a cop or other first responder to locate, given that we live in another state, several states over; however, my brother’s mom lived in the same area as Donny, how is it no one told her hours before, when they discovered his accident? I could go on and tell you the stories and feelings of each family member when they found out about my brother’s death on social media. I could hypothesize why it took so long to try/be able to notify the family, but I will not. The thing is, no amount of guess work is going to change the fact that my brother is dead. I am even now still trying to process this fact. The only thing that I can do now is to try to give his death meaning and this is where #DoItForDon comes into play. 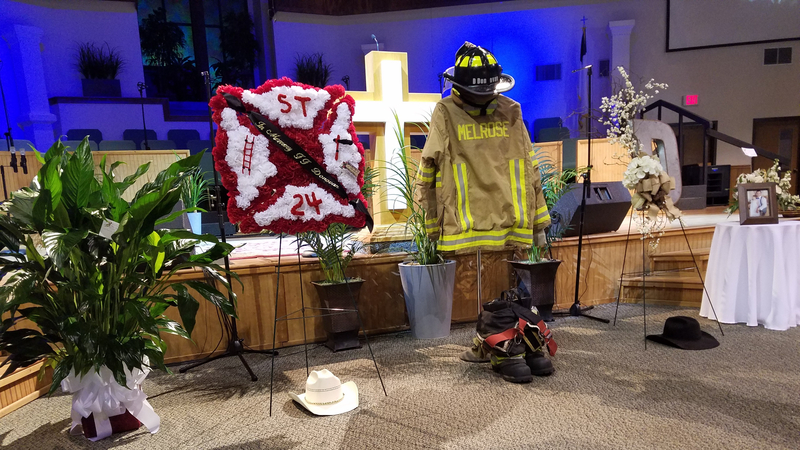 During the planning process for Donny’s memorial service, several wonderful people were working to help us raise money to take care of funeral and other expenses that may come up. A handful of these people made t-shirts in memory of Donny. One black shirt said, “#DOITFORDON” across the chest and had an “In Memory” message on the back. This shirt ended up being my inspiration. As the days went by, I finally came to the decision that I wanted to carry that hashtag forward. I wanted to make a difference and I wanted to “Do It For Don.” One thing that was mentioned in Donny’s obituary was that the family wanted encourage everyone keep an emergency contact card in their car in case of an emergency and so that is the first topic of this emergency preparedness blog which I have started to both honor Donny’s memory and educate those still left here on earth. While there is no guarantee that first responders would definitely find and be able to read your emergency contact card, it is a good safeguard against your family finding out of your accident or other medical emergency as we did Donny’s. It could save your family the double pain of finding out from social media and having to basically research their loved one’s death or whereabouts. Depending on what information you list on it, this card may even save your life. In addition to listing people to contact in case of an emergency, you can also list any medical conditions, allergies, or other important information for the hospital and first responders to know. You can look online for templates or just make your own. Some templates, like the one found at https://geticecard.com/ are fillable online. Other templates, like the one made by AAA (http://www.aaa.com/AAA/057/static/news/AAA_ICE_CARD.pdf), are printable for you to hand write the information onto the appropriate lines. Whichever card type you choose, I suggest that you laminate the paper to protect the information. In addition to keeping a copy of your emergency contact card in your glove box with your car’s registration and insurance, I also suggest keeping a copy in your purse, wallet, or otherwise on your person. In addition, you should also consider setting up your ICE (in case of emergency) contacts in your phone. On my Android smartphone, I can access my ICE contacts by going through the “Emergency Call” option on my lock screen without entering my phone’s passcode. We hardly ever expect to be in an accident or that we will have a medical emergency; however, we can take steps to help the first responders and hospital personnel to notify your family as quickly as possible and even learn important medical information about you. So please, print off an emergency contact card and set up the emergency numbers on your cell phone. Do it for Don…but more importantly…do it for you. Thank you Tiffany. Most of us may have an ICE on their phone, but most of the people who use a phone have a passcode. EMT’s are at a loss. So something in physical form is needed.